Many artists were shocked and concerned over censorship issues when Hong Kong’s Leisure and Cultural Services Department (LCSD) made a controversial request to delete the word “national” from the name of a Taiwanese university in a theatrical troupe’s performance booklet. The LCSD asked the theatre company “The Nonsensemakers” to delete the word from the resume of a member who graduated from the Taipei National University of the Arts. Secretary for Home Affairs Lau Kong-wah spent two minutes reading a press release about the topic at a press conference on March 22. Then he left immediately without answering reporters’ questions. The Leung Chun-ying administration continued to shy away from the issue on March 23. When questioned by reporters that day, Chief Executive Leung Chun-ying was largely evasive and only spent 10 seconds responding to the queries. Candace Chong Mui-ngam, spokesperson of the interest group Artists Action, was concerned about further intervention from the government and whether this would lead to self-censorship, since most of the production costs come from government funding. 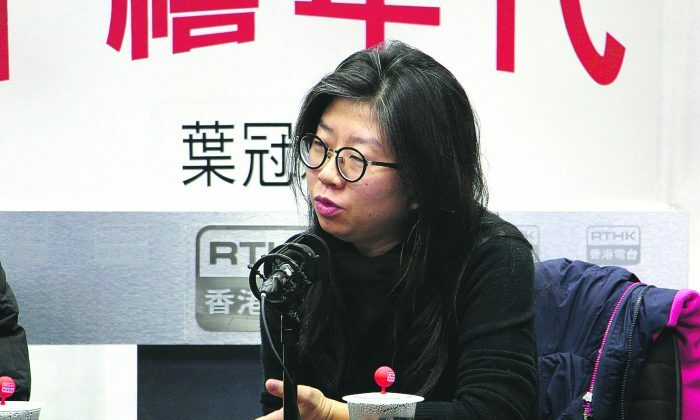 In her capacity as a playwright, Chong said that censorship has never been an issue for her in the past, and hearing about the “no national” incident came as a shock. She said Hong Kong’s political climate and the curtailment of freedom of press in Hong Kong are worrying trends, and she was concerned about this shadow spreading to the theatre. “The theatre is a good platform to reflect various social events, and currently its content has not met with intervention,” said Chong. She added that the incident had a negative influence, and she hopes to maintain the valuable space of creative freedom. Meanwhile, Chan Chu-hei, artistic director of Theatre Horizon, said that his company is funded by the Arts Development Council (ADC). Each year the ADC will fund one programme, and this is quite important to every theatre company, he said. Chan said he currently does not face any pressure content-wise. However, when asked how he would handle it if faced with a similar incident, he said he would be in a dilemma because of restrictions of the contract. Joseph Wong Wing-ping, the former secretary for the civil service, suggested in a newspaper column that Lau should clarify who prohibited the use of “national” or similar wording, and how to handle similar incidents in the future in order to avoid self-destroying the “one country, two systems” principle in Hong Kong.